Commercial Canopies Mid-Land Awnings offers carwash covers which are designed and engineered to be both architecturally pleasing and reliable. 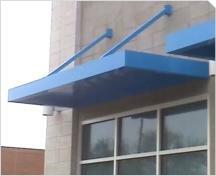 We can integrate your entire site with canopies for a total professional image and consistent appearance. We provide components for a custom-fitted roof unit designed to your specifications which includes beams, roof panels, and mansards. Overhead Supported Canopies Overhead Supported Canopies give you the quality and protection needed over door openings, loading docks, walkways, store fronts, and much more. We offer a variety of styles, shapes, and colors to meet your every need. Contact us today for more information about our service area covering Southwest Missouri. We are your one-stop for design, estimating, installation and quality of end user enjoyment. Deck & Patio Covers Beautiful deck and patio covers add valuable square footage to your home and provide space for outdoor entertaining. 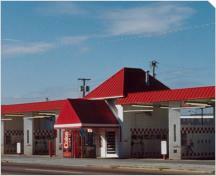 We use quality roof components of aluminum and steel. Each component is custom cut to the exact size that you need. 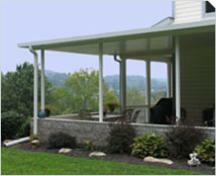 Our patio covers are rugged, weather-tight, and feature a baked-on polyester finish which requires little maintenance. Our expert team will strike the balance of a beautiful addition to your home and quality that will make a sound investment in the value of your home for years to come! 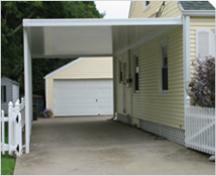 Carport Covers This simple, yet affordable home addition provides year-round protection at a reasonable cost. Mid-Land Awning has a team of experts to evaluate the custom needs of your home regarding protection from rain, hail, snow, ice or blistering heat. All covers are custom fabricated and installed to suit your needs, at a price to fit your budget. We service 100 mile radius from the Joplin, Missouri area covering Southwest Missouri. We welcome your questions and look forward to earning your business! Contact us today for a customized quote.